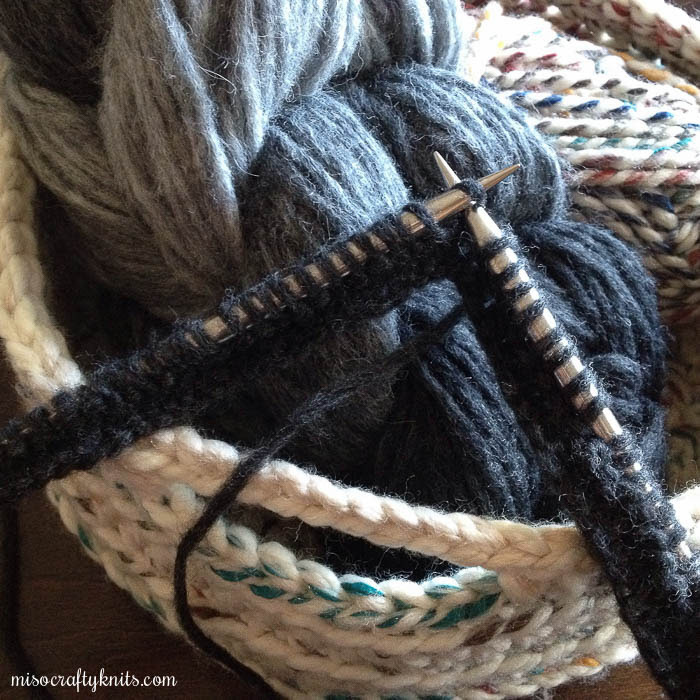 I took all of the weekend before and the majority of last week off from knitting to give my hands a break. My crochet basket did a much bigger number on my hands than I originally thought it would. Actually, to be more accurate, I should say the "crochet binge" I went on did a big number on my hands. If I had taken a longer break instead of a mere day off between crocheting the basket and the tray that still needs to be finished (I ran out of yarn), I'm sure I would've been fine. But I was riding on a huge I-just-finished-an-awesome-FO high and I decided to just keep motoring on - completely ignoring the slight tingling sensation in my hands. Tsk, tsk, tsk...you'd think I'd learn by now. The pains of a CTS flare up is what made me stop for reals and made me remember that I really did need to take a step back, listen to my body, and relax. The yarn, the needles/hook, and the patterns aren't going anywhere. So...not too much knitting has been going on around here. A few weeks ago I received a kit in the mail for a gradient shawl that I've been s.l.o.w.l.y plugging away on (you can see it in the photo above and more on my Instagram feed) in between the stretching and splint wearing, and whenever my hands feel better enough to handle a few stitches here and there. To keep me busy knitting-wise I've been poring over stitch dictionaries and planning out a few baby knits. Quite a number of baby announcements have been made over the past few weeks and I've become a firm believer that baby knits are the perfect opportunity to try out new stitch patterns. My son's school will also be having their annual end of school year fundraising auction and the call for donations will be going out soon. I haven't decided if I will knit another shawl (or two) this year but I thought I would at least look over my queue and stash, just in case my hands are feeling well enough to churn out a few FOs in the limited time frame I've got. I've also been combing my stash looking for yarns to knit one of the patterns from the new collection by Veera Välimäki and Joji Locatelli, Interpretations Vol.3. I'm trying ever so hard to shop within my stash and to not make a trip to my LYS to "supplement" what I have (re: so that I don't buy four skeins of yarn to match one skein from my stash). I'll admit that I have a substantially large stash and you would think I could find something within it to knit a tunic! My goal is to get swatching and have the yarns/colours sorted before the week is over. I want to be prepared because I might be doing some travelling this weekend, which means ferry time = prime knitting time. If not, Spring Break is a little over a week away and I've definitely got some road trip car knitting penciled in!! Ah, Spring...this is when another bout of Starteritis hits. Who else is with me on this one? Ok, with that said I'm going to jet. I've got some stash digging, swatching, and tonight's dinner to cook up!! And I better do it while I'm feeling highly motivated to get stuff done! Hi Melissa, I too have many "irons in the fire": things I need to do, things I want to do, and ideas for new things that keep pickin' at the back of my brain. I do want you to know that you have inspired me to try my hand at socks, never done them before, have done lots of other stuff, so will pick a none complicated one to start with. Then I found a pair on Love Knitting that I want to do next, they are the inconceivable socks. Well, it will be awhile before I actually get there. Good luck with your sock knitting adventures! Spring totally brings the startitis! And I hear you on having a massive stash, yet somehow constantly not having the 'right' yarn for a project... sigh. How does that even happen? That's a cute collaborative between the two designers. I'm glad you're taking care of your hands. I haven't crocheted for quite some time but I usually end up taking some ibuprofen after a session of that craft and I'm wearing Thera-gloves and using ergonomic hooks. I haven't been knitting much since the compost bin took a chunk of skin off of my right middle finger. Yikes!! I hope your finger is healing well and fast!! I've been holding off on finishing my crochet basket tray because I don't want to take more time off from knitting than I need to, but I have only a few rounds to do so I just might take your lead and take some ibuprofen and don my gloves beforehand. Now I know why (aside from not being good at it) I don't crochet much!